Working around the clock, ground controllers have stabilized the two European Galileo navigation spacecraft stranded in the wrong orbit after launching last week, using contingency procedures to coax out the satellites' power-generating solar panels, officials said Thursday. The deployment of both solar arrays on each satellite allows engineers to continue activations and tests of the spacecraft's systems, according to the European Space Agency. Officials are still determining whether the satellites -- the first fully operational spacecraft in the $7.2 billion Galileo navigation network -- can be used to provide precise positioning and timing services to users on the ground. After launching Friday from French Guiana atop a Soyuz rocket, the Galileo payloads were deployed in an orbit with altitude and inclination errors. Instead of releasing the satellites into their intended circular orbit 23,500 kilometers (14,600 miles) above Earth, the Soyuz rocket's Russian-made Fregat upper stage put the spacecraft in an egg-shaped orbit with a perigee, or low point, below the targeted altitude and an apogee, or high point, above it. The orbit's inclination, or angle to the equator, was also about 5 degrees off target, according to tracking data from the U.S. Air Force's space surveillance network. In a statement released Thursday, ESA said "teams are investigating the possibilities of exploiting the satellites to maximum advantage, despite their non-nominal injection orbits and within the limited propulsion capabilities." Each satellite carries about 160 pounds of fuel for in-orbit maneuvers. The propellant load was supposed to last for the spacecraft's 12-year operational lifetime. The Galileo satellites carry eight tiny rocket thrusters designed for minor stationkeeping maneuvers, not orbit-raising burns. 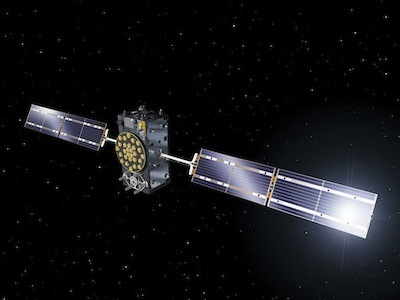 The fuel is not enough to fully overcome the orbit shortfall from Friday's launch, so officials are studying how the satellites can be used away from their optimum positions within the Galileo fleet. The constellation will eventually consist of 30 satellites, including in-orbit spares, spread among three orbital pathways to maximize global navigation coverage. ESA acts as a technical agent for the Galileo navigation system, a civilian-run counterpart to the U.S. Air Force's Global Positioning System. The Galileo program is managed by the European Commission, the executive body of the 28-nation European Union. Investigators are focusing on the rocket's Fregat-MT upper stage manufactured in Russia by NPO Lavochkin. According to a blog post from Johann-Dietrich Woerner, chairman of the German Aerospace Center (DLR), the satellites failed to deploy their solar arrays as intended. Each 1,615-pound spacecraft has two solar panels to generate 1.4 kilowatts of power. Besides the orbit injection error, the Fregat-MT upper stage also apparently failed to put the satellites in a slow "barbecue roll" designed to even out their exposure to solar heating and the cold temperatures of deep space. The stage was supposed to enter a slow spin during a three-hour coast between engine firings during Friday's launch sequence to keep components on the Galileo satellites from becoming too hot or cold. A source familiar with the condition of the satellites said the botched launch "generated unexpected thermal profiles requiring tuning of a number of operational procedures." Controllers at the European Space Operations Center in Darmstadt, Germany, first commanded one solar panel to deploy on each satellite to keep the craft alive. Then engineers set up the satellites to unfold the other solar array. The satellites launched Friday were the first of 22 spacecraft built by OHB System of Bremen, Germany, to reach space. They were supposed to join four in-orbit validation satellites launched in 2011 and 2012 to demonstrate the Galileo network's capabilities. The European Commission and ESA ordered the 22 satellites in two batches. The satellites on Friday's Soyuz launch were purchased in 2010 as part of a 566 million euro contract. Each spacecraft is worth about 40 million euros, or $53 million, under the deal. At the same time as its selection of OHB to build the first set of operational Galileo satellites, the European Commission finalized a contract with Arianespace for five Soyuz launches to send up two spacecraft at a time. The launch contract was worth 397 million euros -- about $525 million, or $105 million per flight. Before Friday's launch mishap, officials planned to send up two more Galileo satellites on a Soyuz rocket in December and aimed to make the constellation fully operational in 2017.